The Portico Arch Gate shuts firmly yet easily with one simple push, keeping your child safe and secure. The exclusive matte bronze finish is designed for exceptional richness, durability and depth of color. The arch on the child gate adds a touch of style and will complement any home décor while its heavy-duty metal construction is built to last! Safety gate swings open both ways for added convenience and offers a triple locking system for peace of mind. 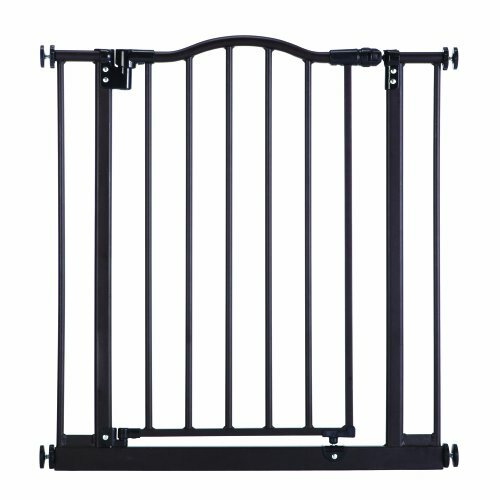 To keep the child gate open for multiple pass-throughs, simply use the hold-open feature to prevent the gate from closing. This baby gate pressure mounts easily by using tension knobs to secure the gate in place. Ideal for a variety of room openings or at the bottom of stairs measuring 28.25" to 38.25" wide with two extensions included and is 28.5" high.